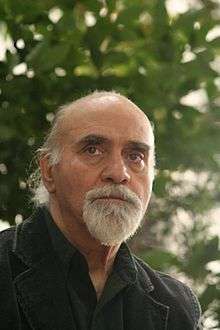 Reza Baraheni (Persian: رضا براهنی‎‎; born 1935 in Tabriz, Iran), is an Iranian, an exiled Iranian novelist, poet, critic, and political activist. Former president of PEN Canada, Baraheni lives in Toronto, Canada, where he used to teach at the Centre for Comparative Literature at the University of Toronto. He is the author of more than fifty books of poetry, fiction, literary theory and criticism, written in Persian and English. His works have been translated into a dozen of languages. Moreover, he has translated into Persian works by Shakespeare, Kundera, Mandelstam, Andrić, and Fanon. Winner of the Scholars-at-Risk-Program Award of the University of Toronto and Massey College, Baraheni has taught in the University of Tehran, Iran, University of Texas in Austin, Indiana University in Bloomington, Indiana, the University of Maryland, Baltimore County, the University of Toronto and York University. He has also been Fellow of St. Antony’s College, Oxford University, Britain, Fellow of the University of Iowa, Iowa City, and Fellow of Winters College, York University. Baraheni, along with his late friends and fellow-writers, Jalal Al-Ahmad and Gholamhossein Saedi, initiated the first steps in 1966 leading to the founding of the Writers Association of Iran in the following year. Their historical stormy meeting with the Shah’s Prime Minister Amir-Abbas Hoveida in that year, led to an open confrontation with the Shah’s regime, placing the struggle for unhampered transmission of thought as a preliminary step towards genuine democracy on the agenda of Iran’s contemporary history. In spite of the laborious struggle of some of the most famous writers of the country to turn the Writers Association of Iran  into an officially recognized human rights organization, the Shah’s government suppressed the association, intimidated many of its members, arresting and torturing some of its members, among them Baraheni, who had returned from the United States after the completion of a year-long teaching position in Texas and Utah. In 1973, he was arrested and imprisoned in Tehran. Baraheni was tortured and kept in a solitary confinement for 104 days (See God’s Shadow, Prison Poems, 1976; The Crowned Cannibals, 1977, Introduction by E.L. Doctorow). In 1976, during his exile in the U.S., human rights organizations were alarmed that the Shah’s SAVAK agents had arrived in the U.S. with the intention of assassinating Iranian opposition leaders, among them Baraheni. With the help of the American PEN and the assistance of Ramsey Clarke, Baraheni exposed the Shah’s plot. Baraheni returned to Iran in the company of more than thirty other intellectuals in 1979, four days after the Shah fled the country. Baraheni, who had been a founding member of the Writers Association of Iran, had no political ambitions. He joined his friends in the association, and this time the uphill struggle for democracy and the unhampered transmission of thought, in fact, the battle against repression and censorship, was with the newly established Islamic Republic of Iran. Baraheni’s concentration was on three major themes: 1)the unhampered transmission of thought; 2)equal rights for oppressed nationalities in Iran and; 3)equal rights for women with men. In the wave of the crackdown against the intellectuals, the liberals and the left in Iran in 1981, Baraheni found himself once more in the solitary confinement, this time under the new regime. Upon his release from prison in the winter of 1982 under international pressure, he was fired on the trumped up charge of having cooperated with counter-revolutionary groups on the campus of the University of Tehran. He was not allowed to leave the country for many years. With the death of Khomeini, senior members of the Writers Association of Iran, Baraheni among them, decided that they should revive the association. They formed the Consulting Assembly of the Writers Association of Iran, and wrote two texts of utmost importance. Baraheni was one of the three members of the Association who wrote the “Text of 134 Iranian Writers.” He was one of the “Group of Eight” who undertook the job of getting the signatures of other Iranian writers. He was also secretly assigned to send the text to his connections abroad. Baraheni translated the Text into English and sent it to the International PEN. The second text was the re-writing of the charter of the Writers Association of Iran. Several times, Baraheni and two other senior members of the association were called by the Revolutionary Tribunal of the Islamic Republic of Iran, asking them to withdraw their signatures from the resolutions of the association, and Baraheni was told that he was a persona non grata. He knew that he had to leave the country. Baraheni made arrangements with Swedish friends to get out of Iran and travel to Sweden. With the help of Eugene Schoulgin, head of the International PEN’s “Writers in Prison Committee,” and Ron Graham, the President of PEN Canada in 1996, Baraheni sought asylum in Canada. He arrived in Canada in January 1997. He later became the President of PEN Canada (2000–2002). During his presidency, Baraheni recommended a change in the Charter of the International PEN to permit the inclusion of all kinds of literature in the charter. He now lives in Canada where he was a visiting professor at the University of Toronto’s Centre for Comparative Literature and past president of PEN Canada from June 2001-June 2003. He was also the featured poet in the Hart House Review's 2007 edition, which featured exiled writers and artists. I learned Persian at great cost to my identity as an Azerbaijani Turk, and only after I had mastered this language and was on the point of becoming thoroughly Persianized was I reminded of my roots by those who were directing polemics against me in the Persian press. ↑ The Rising Tide of Cultural Pluralism: The Nation-State at Bay? by Crawford Young, 1993, p. 126. ↑ Baraheni, Reza (2005). "The Midwife of My Land" (PDF). Idea&s Magazine. Faculty of Arts & Science, University of Toronto. 2 (1). "Addressing Butterflies : a Poetry Collection in Persian; 2/9"
"Addressing Butterflies : a Poetry Collection in Persian; 3/9"
"Addressing Butterflies : a Poetry Collection in Persian; 4/9"
"Addressing Butterflies : a Poetry Collection in Persian; 5/9"
"Addressing Butterflies : a Poetry Collection in Persian; 6/9"
"Addressing Butterflies : a Poetry Collection in Persian; 7/9"
"Addressing Butterflies : a Poetry Collection in Persian; 8/9"
"Addressing Butterflies : a Poetry Collection in Persian; 9/9"